After the huge success of our posts last year chronicling the roof repairs to an Academy school roof in Yorkshire, we’re doing it again this year, but for a school which is being repaired during term time. Many thanks to the business manager of this school in Darlington, County Durham for agreeing to let us document the process for you. Read our posts in the coming weeks to find out what happens as we repair and replace several of the school roofs. If you aren’t a subscriber you can sign up here to receive an email notification when we publish the latest instalment. The school we’re going to be writing about over the next few weeks is a Primary Academy in Darlington, with around 450 pupils which is much larger than average. The school is part of a Multi Academy Trust and became an academy five years ago. We’re not naming the school to protect its confidentiality, but read on – you’ll no doubt find many familiar features of this school’s situation which chime with your own. Like many primary schools in the UK, this academy is a mixture of single and multi-storey buildings and was originally built in the middle of the last century and then extended several times over the decades. The school now comprises a multitude of interconnected buildings which have grown up over the years as the school has grown and its needs have changed. All the roofs are flat with different designs and build ups, and are of varying ages and conditions. This can be very confusing to the untrained eye, particularly if as a school business manager or head, you don’t have a record of the full history of the site and buildings. To be able to assess the situation needs some experience and technical skill to determine the age and current condition of the fabric. In this way, a programme of improvements can be developed and funding applied for accordingly in a structured manner. We were contacted by our specialist partner consultants and project managers D3 Associates to ask us if we could assist them in the project and make the CIF funding application. The school has been suffering for many years from leaking roofs and an application to the Condition Improvement Fund (CIF) for funding had been made but knocked back for various reasons. We researched the CIF reasons for refusal and as a result, were able to make a more robust bid for the 2018/19 round of funding which was successful. Overhead view showing how the school has built up over time, with four phases identified. 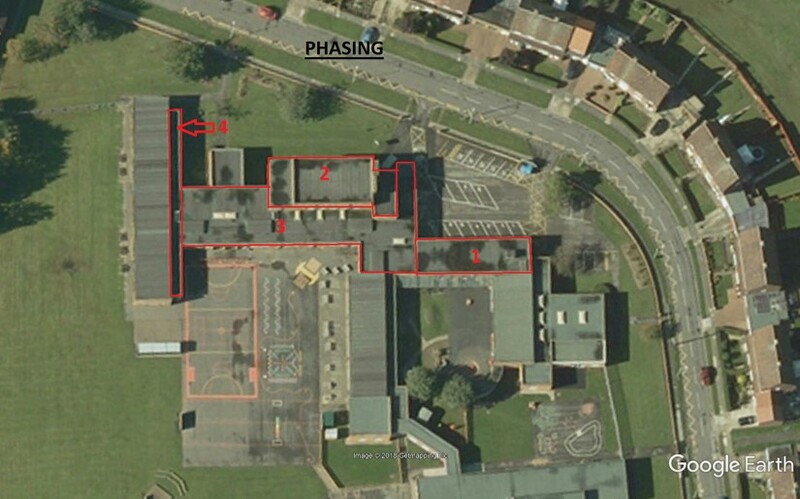 A survey of the whole of the school roof identified four roofing areas shown in the plan which were in the poorest condition’ these were put forward for CIF funding in the first instance. All these areas were built over a concrete structural deck with falls to provide drainage formed in the rigid PIR Insulation and waterproofed with bitumen membranes; however, they were all different ages, were in different states of decay and had different issues. One roofing area over the dining hall had completely broken down and the roof had failed down to the concrete deck. In some areas, the membrane laps (joins) had completely failed and this was allowing a lot of water in whenever it rained. The insulation was completely saturated and the entire roof would need replacing. Two of the roofing areas over classrooms and corridors were not in so bad condition. The membrane was, however reaching the end of its natural life and was suitable for a roof overlay. These areas also have single skin GRP rooflights which were hazardous and needed replacing. The classrooms below including a computer room which has equipment which it is particularly important to keep dry. The final area is a corridor roof which was reaching the end of its natural life, but due to the proximity of UPVC windows an alternative approach to the re-roofing will be taken, in accordance with Safe2Torch guidelines. Safe2Torch is the National Federation of Roofing Contractors risk assessment strategy which aims to introduce best practice in the use of ‘hot works’ (naked flames and hot materials and tools) in roofing. The intention is to reduce the risk of roof fires when using gas torches on roofs, torches which are used in the application of some bitumen roofing systems. The strategy is designed to confirm that there is a fire risk (or fire risk cannot be ruled out) alternative torch-free solutions to roofing will be used. 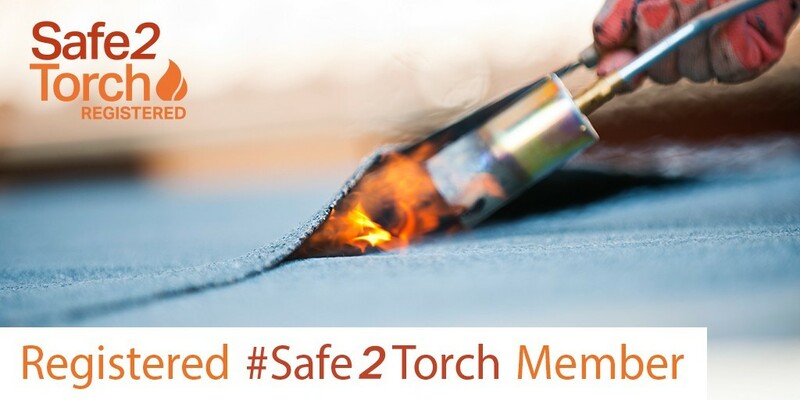 SIG Design and Technology are signatories to the Safe2Torch pledge and a Registered Safe2Torch Member. Read our Safe2Torch Guide for Clients here. 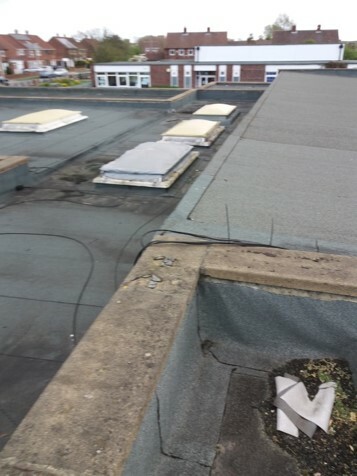 Modern torch-applied bitumen roofing systems are extremely effective and high quality and used throughout the country (including on this school) but with repair and replacement using these materials there is always a need to assess the fire risk. The Safe2Torch strategy is always applied by our surveyors, and in this case the corridor area was identified as an area where there was a potential risk of fire due to the UPVC windows alongside the roofing area. As an impartial supplier of roofing materials, SIG Design and Technology can recommend the right products for any situation, and in this case a specification has been developed which does not use ‘hot works’ but instead a cold applied liquid roofing repair. Corridor with UPVC windows – liquid repair. Area 2 is a higher level roof than area 3, so this will be carried out first in order to provide safe scaffolding around the roof from below. We’ll then carry out the dining hall complete replacement, followed by the other classrooms and finally the corridor with UPVC windows. D3 Associates’ role in the project will be will be to provide architectural drawings, project management, cost management, building surveying and CDM (Health and Safety) advisors. SIG Design & Technology will support the design and detailed specification, assist in the selection of an accredited contractor, supply the materials, monitor the installation and provide guarantees and maintenance advice. We are experienced working together as a team and expect the project to go very smoothly. We’ll be blogging about these works over the coming weeks to to give you an idea of what it is like to have this sort of work done on your school. As an introduction, next time we’ll be blogging about the issues to consider when reroofing and recovering school buildings when the school is in use.